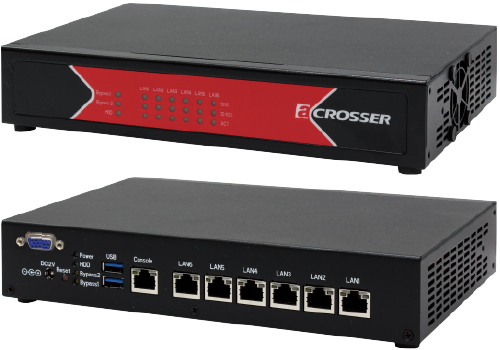 Today, Acrosser Technology Co., Ltd. (acrosser) proudly announces its brand-new cost effective network appliance with AMD® processor, in view of its commitment to utilizing its valuable resources in further developing its advanced Network security product line to meet various customer requirements. This latest Micro Box (slim-type, desktop-sized) network appliance with AMD® processor product line includes 4 different models, as follows: AND-G420N1, AND-G412N1, AND-G412N1V and AND-L218N1. ◎AND-G420N1 features the AMD® 2nd Gen G-series SoC GX-420MC, 4-core@2.0GHz, 2MB L2 without GPU◎AND-G412N1 features the AMD® 2nd Gen G-series SoC GX-412TC, 4-core@1.2GHz, 2MB L2 without GPU◎AND-G412N1V features the AMD® 2nd Gen G-series SoC GX-412HC, 4-core@1.2GHz, 2MB L2 with GPU◎ AND-L218N1 features the AMD® 2nd Gen G-series SoC LX family GX-218GL, 2-core@1.8GHz, 1MB L2 with GPU. As maybe noted. these 4 models all support up to 16GB of DDR3-1600 SO-DIMM RAM, 6 x Intel® GbE LAN, dual USB 3.0 ports, dual USB 2.0 (internal pin header) ports ,1 x Console (RJ45), 8 x GPIO (4-In, 4-Out) internal pin header and 1 x VGA (AND-G412N1V and AND-L218N1 only). These entry-level network appliances with AMD® processor offer customers a value segment solution and stable network performance at a reasonable cost, and at the same time is an ideal desktop network appliance for network security applications like Firewall, IDP/IPS, anti-spam/virus, VPN…etc. For pricing and availability, please send your inquiry at:http://www.acrosser.com/inquiry.html. This AMD G-series G420 model is good to me, please quote me @ 10 pcs bases. Thank you so much. or you can pass the manufacturer information to me.